NEW YORK CITY — The crushing crowds, heavy traffic and noise pollution can make even the toughest New Yorkers crave some peace and quiet. Though it sometimes seems hard to believe, there are a few places where you can leave behind the hustle and bustle without traveling out of the city. DNAinfo New York found a serene spot in each of the five boroughs. Tell us your favorite places to relax and find some peace and quiet in the comments below and we’ll add them to the map. Hours: Wednesday through Sunday, 1 to 5 p.m.
Nestled atop Lighthouse Hill in Staten Island and built to resemble a small Himalayan mountain monastery, the Jacques Marchais Museum of Tibetan Art can make visitors feel like they’ve escaped New York. “You really don’t feel like you’re in the city,” said Meg Ventrudo, the museum’s director. The museum is surrounded by trees and terraced gardens and holds one of the largest collections of Tibetan art in the country, Ventrudo said. The museum also offers Tai Chi and meditation classes on the weekend. Both classes are $12 per person but $10 for museum members. Hours: Tuesday through Sunday from 9 a.m. to 5:30 p.m (until 8:30 p.m. on "Sunset Wednesdays" during the summer). Admission: $8 for adults, $4 for students and seniors and $2 for children who are at least 6 years old. Program fees vary. The Bronx's Wave Hill has about a dozen gardens on its 28-acre property, as well as scenic views of the Hudson River and the Palisades, making it a good place to relax, said spokeswoman Martha Gellens. A popular place to reflect is the aquatic garden, which is surrounded by vine-covered pergolas. Visitors can also gaze out at the Hudson while sipping a glass of wine from the Kate French Terrace, or nestle into one of the garden’s wooden lawn chairs while reading a book. Wave Hill also hosts free garden and gallery walks, as well as other programs for a fee, like Hatha yoga, Tai Chi and meditation classes. Most people don’t associate Manhattan with green spaces, but over in the East Village many residents have turned vacant lots into verdant escapes from the daily grind. The neighborhood features dozens of community gardens maintained by different groups, each with its own unique personality. Most gardens are open on weekends or when the gates are unlocked and members are present, but a few also welcome guests during the week, like the Creative Little Garden on East Sixth Street between Avenues A and B and the 6BC Botanical Garden located on the same street a block away, between Avenues B and C.
The Creative Little Garden is open daily from 11 a.m. to 6 p.m. April through November, except in inclement weather. Sculptures and benches line a woodchip path leading to a stone patio in the back, where visitors enjoy quiet conversation or a book. The lush greenery of the 6BC Botanical Garden creates a physical barrier between the green space and the street, as well as little pockets of privacy between the garden’s seating areas. It is open until 8 p.m. on weekdays and from noon to 4 p.m. on weekends. Many gardens also host various types of programming, from Saturday morning yoga at La Plaza Cultural on the corner of East Ninth Street and Avenue C, to children’s story times and live music at the 6B Garden on East Sixth Street and Avenue B. Hours: Wednesday, Thursday and Friday from 10 a.m. to 5 p.m. and on Saturday and Sunday from 11 a.m. to 6 p.m. Admission: General admission is $10, but $5 for senior citizens and students. Admission is free for New York City high school students, museum members and children less than 12 years old. Japanese-American artist Isamu Noguchi founded and designed the Noguchi Museum in 1985 to showcase what he considered to be the most representative examples of his work. Today, visitors can view his work in the converted industrial building, which includes modern sculptures in stone, metal, wood and clay, as well as drawings and models for public projects and gardens, stage sets and furniture. For New Yorkers looking to relax, the museum’s outdoor garden, where the sculptures almost appear to be part of the natural landscape, is a must-see. Hours: The Fifth Avenue and 25th Street entrance is open daily from 7:45 a.m. to 6 p.m., other entrances are open from 8 a.m. to 4 p.m. Admission: Free. Tours and other programs are also available, usually for a fee. 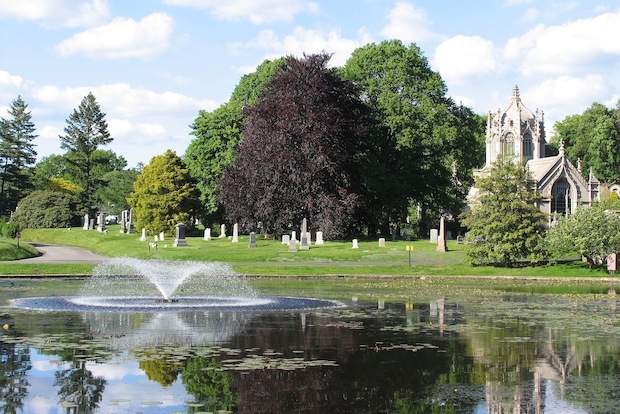 New Yorkers have found peace and quiet in Green-Wood Cemetery since it opened in 1838, when public parks were nonexistent in Manhattan and Brooklyn, said Lisa Alpert, the cemetery’s director of development and marketing. Visitors can wander through the site’s winding and hilly paths, reflect at one of its four ponds and take in the view at Battle Hill, the highest natural point in Brooklyn and the location of a Revolutionary War battle. “It’s a very peaceful, tranquil sort of escape from New York,” Alpert said. History buffs can also visit the gravesites of notable New Yorkers like composer Leonard Bernstein and artist Jean-Michel Basquiat, while art-lovers can admire the cemetery’s Gothic architecture and statuaries. Where are your favorite places to rest and relax? Let us know and we'll add them to the map below.